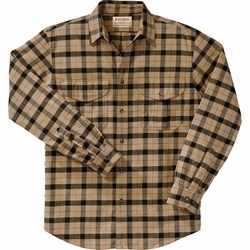 Filson Alaskan Guide Shirt. Filson's iconic Alaskan Guide Shirt is made with midweight breathable cotton flannel that’s wind-resistant and brushed for soft comfort. A pleated back provides a full range of motion, perfect for hunting, fishing, working and daily use. The long hem offers full coverage and keeps the shirt tucked in. Button front with two chest pockets and button-adjustable cuffs.